Demark leading the dance workshop. 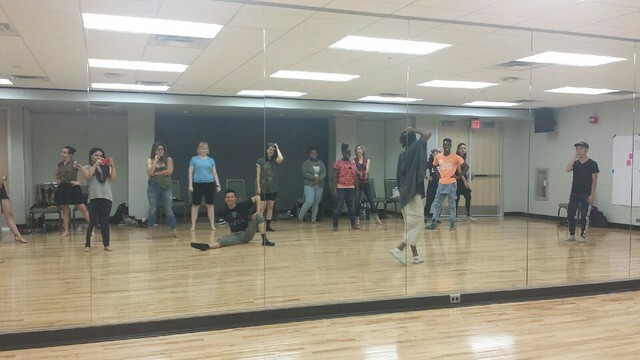 CoLab Radio: You use dance as a way to engage the stigma around HIV. Why and How do you do this? Demark Manigo: I am a dancer so I have no other choice. If I hear music honey, I’m going for it. That is just how I am. All my life I was a performing arts kid. I know that it is my calling and that it is my gift and I am destined to do things within the creative and performing arts arena, so why not use dance? I also know that I’m not a Baryshnikov or a Desmond Richardson. I’m not a Bill T Jones and I’m not an Alvin Ailey, as far as having great dancing facility. It is just that I have the passion and I’ve just been blessed with some training. So I had to do something to give back. I went to a dance session at another conference and it was there that I was like, oh child, I can do this. I can teach this. I can do that same warm up and all that type of stuff. I can do even more because I feel like as a dancer we have so much to give to other people. I know that my calling and purpose is to heal others so it is my duty to use dance to heal. At Armstrong State University I teach fitness. I’m a personal trainer. Our recreation center does programs where we do HIV testing and what not. I sit as co-chair of the Coastal Care Consortium- a hub of public health professionals who come together to discuss ways to engage the community about HIV and AIDS and other STDs. There are no words to define what it is like to live with HIV, let alone to interact with the world and the world interact with you because it is still not looked at like diabetes, or high blood pressure. People are fearful and afraid to get tested because of the stigma behind it. To break the stigma against HIV I have to call other people to rise and the best way I can do that is through dance. CoLab Radio: Can you explain the workshop and how you used dance in this space to fight the stigma against HIV? CoLab Radio: What do you want people to take away from this session? Demark Manigo: I don’t what you to leave the same way you came in. You are powerful. That was just confirmed in this space. And now that you have that power and you operated that power I want you to go out and use that power, and let it do what it is supposed to do. Don’t just feel it here in the physicality of your body and flesh but let it affect your soul and nourish your spirit. We are spirit beings and yield so much spiritual power. We can take that same thing and send it out to make our pathways successful. CoLab Radio: Where can people find you? Demark Manigo: You can find me on Facebook at Demark Manigo, on twitter @MorningTeaD. I’m a Radio Host show and my show is called Morning Tea. It airs 11am ET and you can access it through NYPS Network. I also have a ballet called Deion’s Story: A Fight to Survive set to premier July 29th, 2016 at Armstrong State University in Savannah Georgia. CoLab Radio is profiling the many ways in which a selection of individuals from the 2016 Allied Media Conference use collaborative processes grounded in media, art and technology to address the roots of problems and advance holistic solutions towards a more just and creative world. Post by Nse Esema. Image by Sofia Campos.